Knights Armament has produced many rails for the U.S. military. Most well known are the M5 RAS used on the M16A4 and the M4 RAS used on the M4. RAS stands for Rail Adapter System. However prior to the M4 RAS, this was the M4 RIS. The Rail Interface System was used on the CQBR uppers which led to the MK18MOD0 . 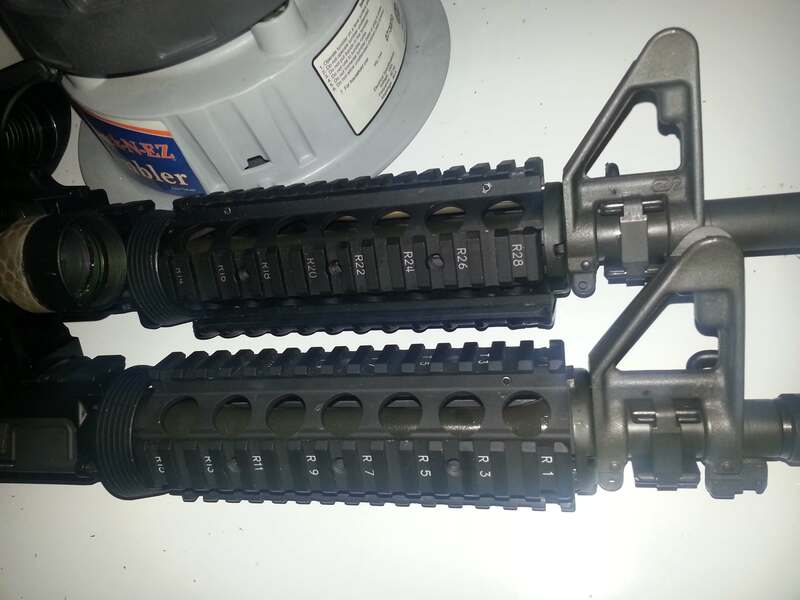 The RIS, bottom one in the photo above, is secured using a clamp on the handguard cap. You can see this clamp in the photo above. Easiest way to identify a RIS is noticing that the odd numbering counting up backwards from the front of the rail. The more commonly found RAS has a spring tap on the front that goes under the handguard cap( and is commonly installed over the handguard cap, newer models have this tab modified to prevent incorrect installation). On the top rear of the RAS, there is a screw for the clamp that grabs the barrel nut. Even numbered markings count up from the rear of rail. A M4 RAS retails for $351 dollars. For that price you can buy newer better free float rails. However on the secondary market or from Knights own store you can purchased used or blemished M4 RAS handguards for good prices. The main reason for this rail popularity is due to its used by the U.S. Military, but it is a good solid piece of kit regardless. The RIS is harder to find, and mainly purchased by people wanting to make clones of the MK18MOD0. Personally only reason I own one is that it came as part of a package deal. The RIS is nice, but the RAS is better. The only advantage the RIS has is that it can accept a slightly larger barrel profile, but ff you are going to use a barrel that large, you would probably be better off with a different handguard. If you would like to know more, there is a good old write up about the two rails on Quarterbore. They were really something for their time but sadly that time has come and gone. Now with FF rails offering more and for less it is time for us to me past the KAC RIS/RAS on to greener pastures. It should only be 6 months or so before we find out what the successor to the RAS will be. Good post though, and you are right the RAS is a good rail system even though its outdated.